and “Moon and Star“. 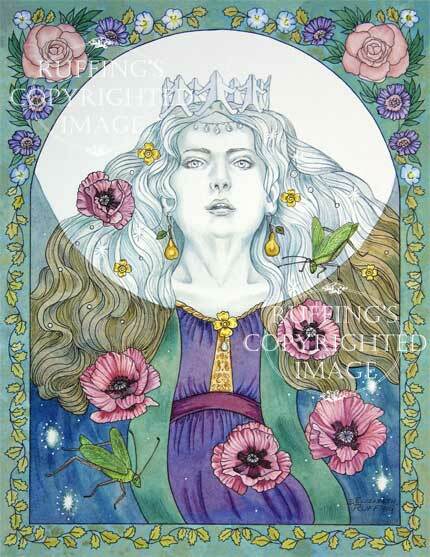 Both are fantasy pieces and are taken from my original watercolor and pen and ink paintings. When I painted “The Moon Sings a Lullaby Full of Poppies and Katydids”, I was imagining what kind of lullaby the moon would sing, if the moon could sing, to help people drift off to sleep. I thought of the sounds of katydids, which I’ve always loved to listen to on summer nights. And I thought of the poppy field in “The Wizard of Oz“, which caused Dorothy and her friends to fall asleep on their way to The Emerald City. So, this is a picture of the moon singing us all to sleep with a lullaby full of poppies and katydids. In “Moon and Star“, I’ve depicted the moon as a woman with butterfly wings and the star as a little girl, both descending toward the horizon at dawn. The watercolor sky has shades of turquoise and blue and a little bit of yellow all dropped into a wet background for a soft effect. Both giclées are a standard 8.5 x 11 inch image size on 9.5 x 12 inch fine art paper. 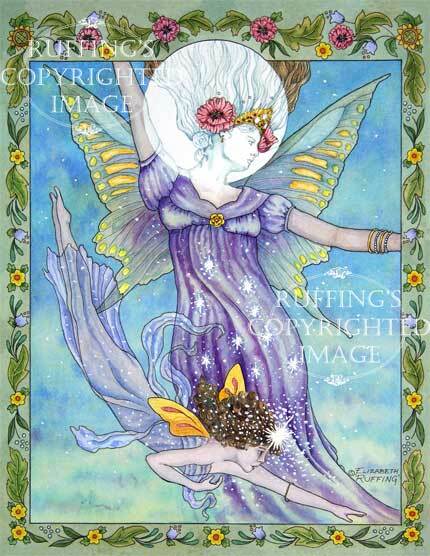 Please visit my shop for these and other fairy art prints.